Build your custom set today and call us to make it come to life! 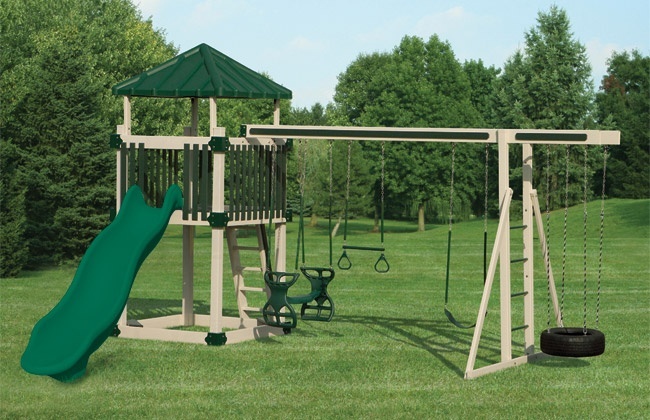 Click Here to build your custom swing set today. 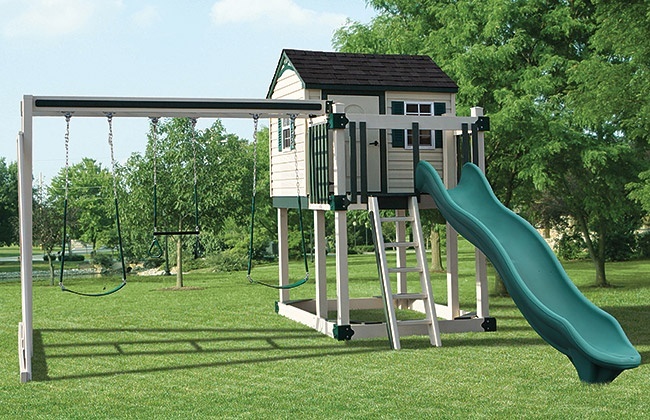 The A-4 Special swing set has many features that set it apart. Climb the flat step ladder to the gabled tower. Then, slide down the avalanche slide or build a castle in the sandbox. The ten foot swing beam supports up to three swing positions. Go with the standard glider, infant and belt swing, or customize the swing selection to meet your family’s unique needs. 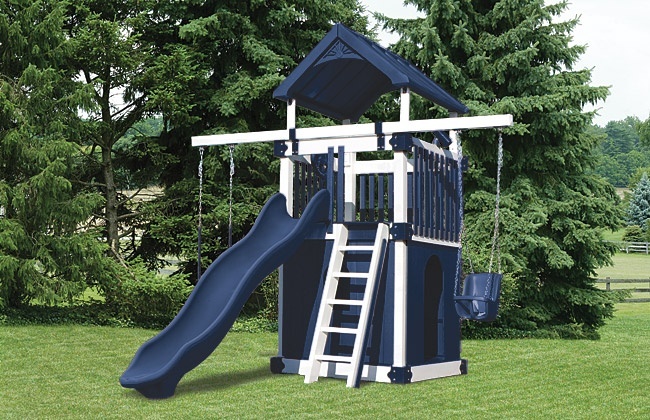 The A-5 Deluxe swing set includes the same flat step ladder, tower, avalanche slide and three position swing beam that comes standard with many of the Castle Tower Series playsets. Then, it adds a rock wall, steering wheel and bonus fourth swing, to truly earn the name deluxe. The Tunnel Escape playset is big fun. Children can climb the flat step ladder to the playhouse, where the steering wheel is waiting for a spin. Then, exit down the avalanche slide or navigate the tower tunnel. They can use the periscope to check out their surroundings, or peak through the bubble panel before racing down the turbo twister slide. Also included are a picnic table, sandbox, horse rider, basket glider, trapeze and belt swing. 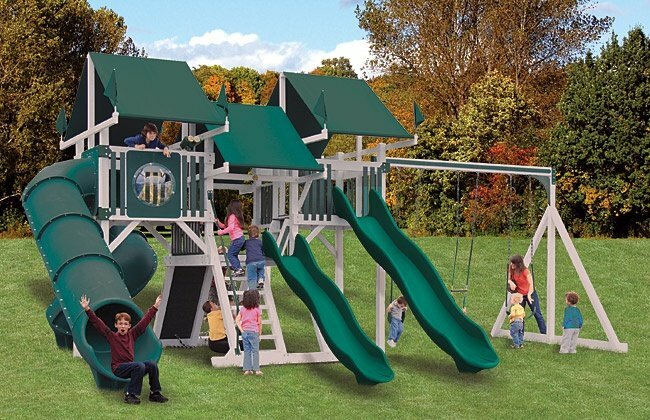 The Tunnel Escape playset is like an amusement park in your own backyard. This is the perfect playset for your little prince or princess. The Castle playhouse connects to a tower and bridge, providing an ideal vantage point to survey the kingdom. The ten foot wave slide, belt swing, trapeze, plastic glider, and picnic table add an element of noble fun. The Bridge Escape playset has something for everyone. Parents, watch imaginations come alive while relaxing on the fan back lawn swing. 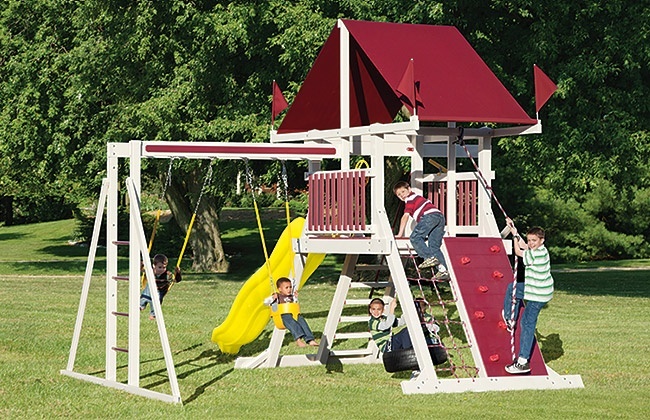 There is a baby swing for infants, and for the older kids, this playset includes a belt swing, three rope tire swing, and trapeze. For those that crave adventure, climb the five foot rock wall or cargo net to the tower, steer the ship’s wheel, and keep look out with one of two binocular sets. 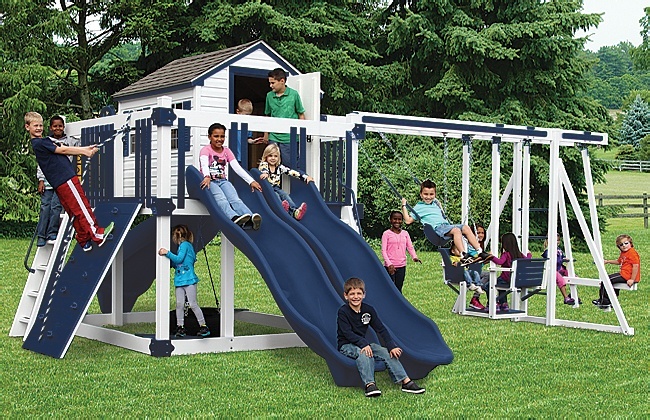 The Hideout playset is loaded with great features to encourage hours of active play. Children can scale the five foot rock wall to their very own playhouse retreat. From there two avalanche slides and a turbo twister await to carry them back to ground-level. 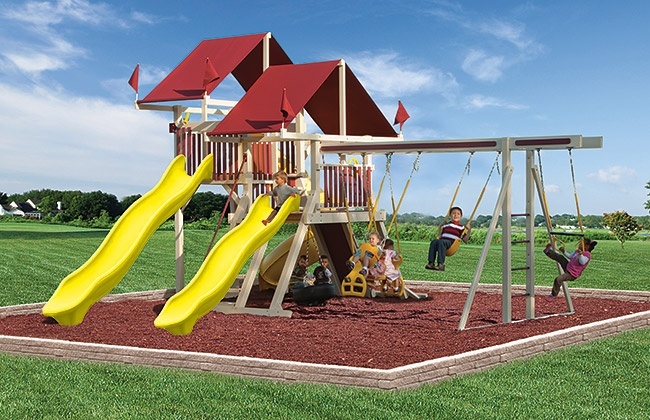 Once on the ground this playset offers an assortment of swings including a belt swing, baby swing, basket glider, horse rider, and three-rope tire swing. A ship’s wheel and tic-tac-toe panel round out the fun. 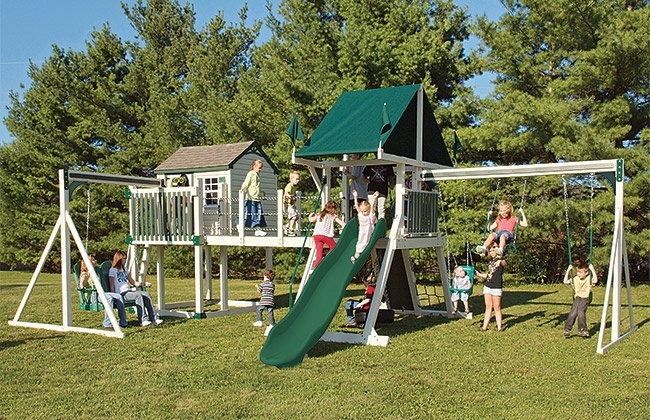 The KC-1 Clubhouse playset boasts a fourteen by twelve foot footprint, which makes it ideal for a yard with limited space. 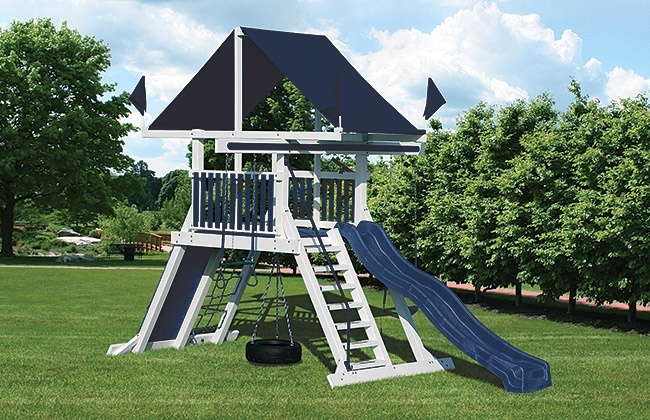 With its two position swing arm, tower with ship’s wheel and binoculars, enclosed clubhouse, step ladder, and ten foot avalanche slide, it is small on space but big on fun. 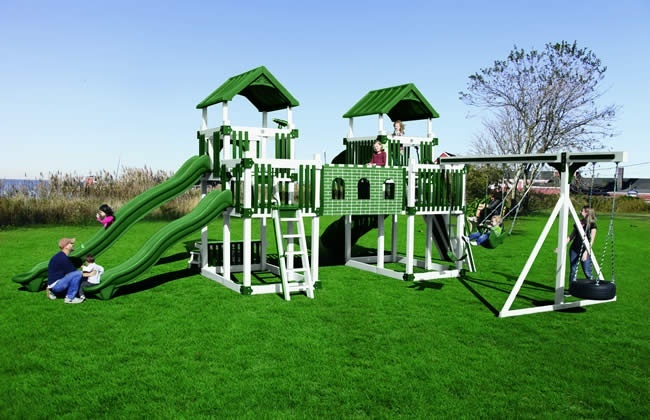 The KC-7 Deluxe playground will transform your backyard into a spectacular playtime arena. 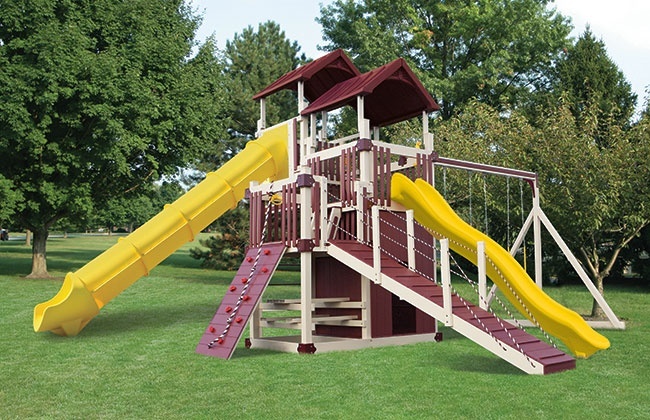 The tower system boasts dual avalanche slides connected to a five foot high deck. It then incorporates a lemonade stand, bubble panel, ship’s wheel, and flat step ladder for tower access. The three position swing beam holds a belt swing, a rubber infant swing and glider. This deluxe playset offers endless ways to foster super-sized imaginations. The KC-8 Fitness Tower will get your little ones ready for their own little boot camp. They can access the 5X5 tower with vinyl top from several access points. Optional wood grain adds 18% but other colors are available at no extra cost. The KC-10 Economy Turbo includes both a wave and turbo twister slide. The four position, fourteen foot, single swing beam offers fun for children of all ages, and comes standard with a baby swing, trapeze, belt swing and daisy disk. 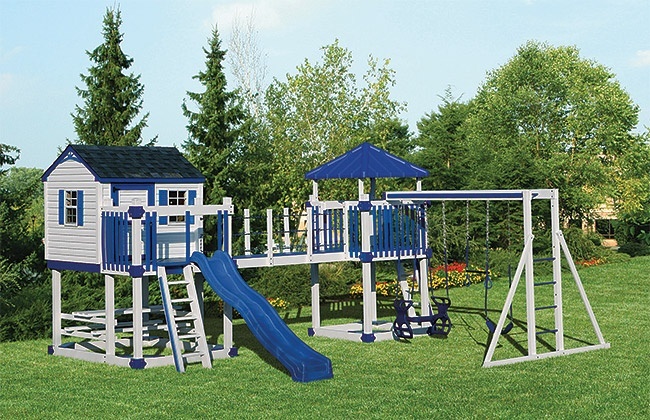 Top it all off with an optional sandbox, and this playset will keep your kids entertained for hours. 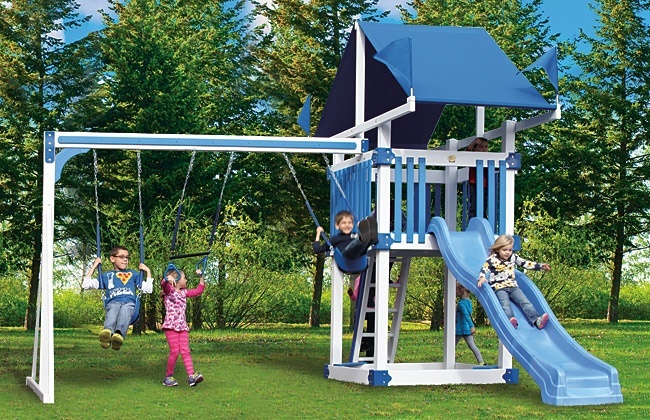 The enormous KRC Extreme is Swing Kingdom’s largest playset. It is big enough to accommodate the entire neighborhood, and then some. Three double towers, three slides, two rock walls, two cargo nets, flat step ladders, jungle bars, a twelve foot ramp, tower tunnel and bridge are just the beginning of what makes the extreme an amazing place to play. 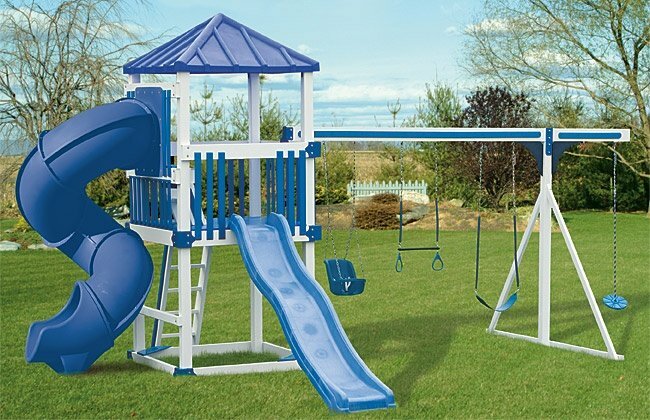 It also boasts a plastic glider, trapeze, three belt swings, baby swing, horse rider, hammock swing, and a three-rope tire swing. Adding to the fun are the sandbox, bubble panel, tic-tac-toe panel, ship’s wheel, two binoculars, a steering wheel, telescope, periscope, clubhouse, and picnic table. The extreme is activity filled fun for kids of all ages. 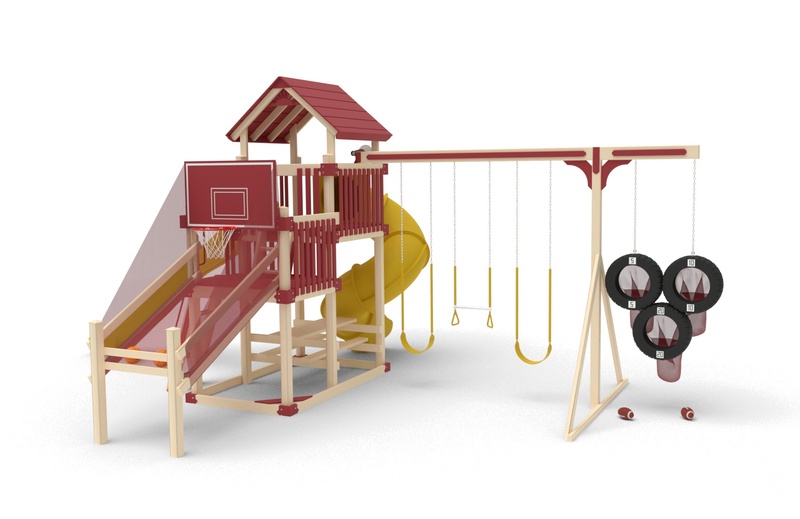 The KTB-2 Turbo Tower playset offers plenty of healthy options. Climb up the flat step ladder or scurry up the rock wall to one of two towers. Navigate rough waters with the ship’s wheel or stand lookout at the binoculars. Once the ship has come to shore, slide down the turbo tunnel to dig for buried sandbox treasure or take advantage of the three position swing beam with two belt swings plus a baby swing. 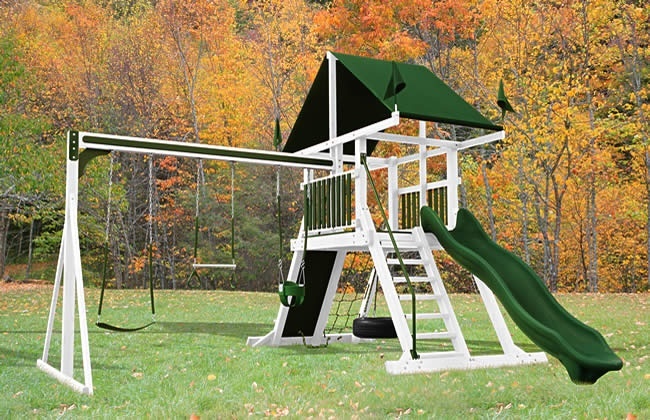 The RL-1 Adventure swing set lives up to its name. 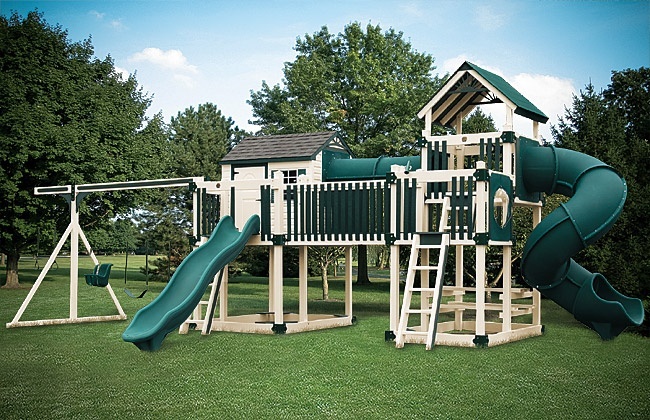 This playset features two towers, connected by a castle bridge that can be accessed by a flat step ladder, or a seven foot rock wall. The Adventure includes two avalanche slides and a turbo twister slide. 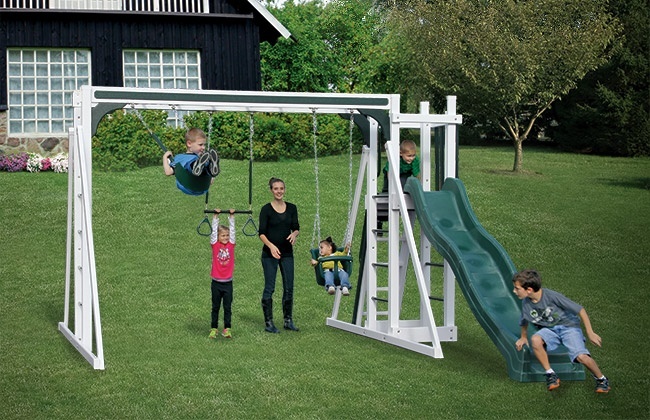 The four position swing beam comes with a belt swing, trapeze, baby swing and four-rope tire swing. To round out the fun, a bubble tunnel, binoculars, fire pole, ship’s wheel, spot light and lemonade stand are included. 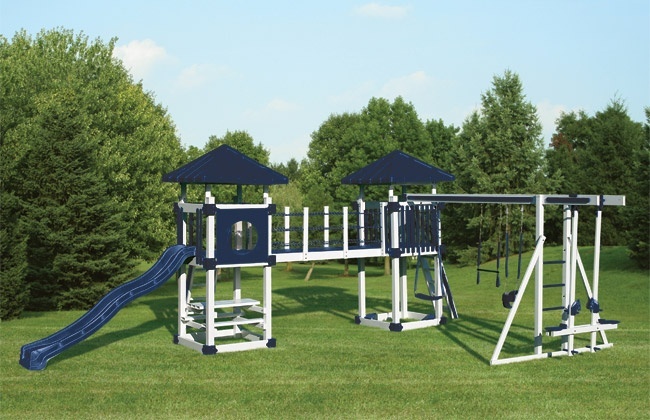 With our all new RL-3 sports center playset your kids will enjoy hours of outdoor sports activity all in one unit. With the new 3 tire QB challenge, Buzzer Beater Hoop, 5X9 double tower offering a 14’ avalanche slide and a 7’ turbo twister slide, flat step ladder with access railing, 4 position single high beam with 2 belt swings and 1 trapeze. Other colors available. 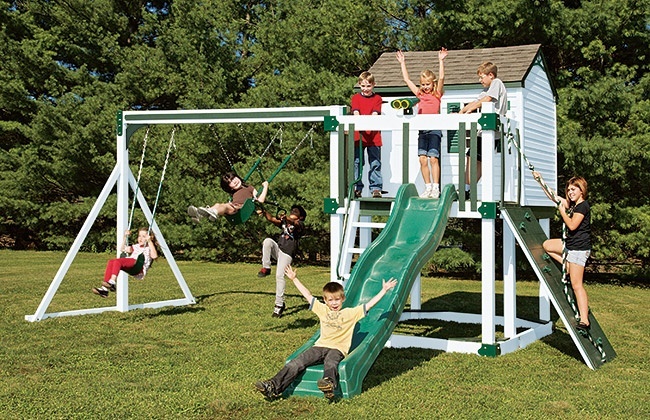 The Cliff Lookout swing set offers loads of fun and excitement. With three deck heights, and tons of tower access options, the sky’s the limit. Kids can climb the jungle bars, scramble up the rock wall, or run down the twelve foot ramp. While atop the towers, spin the steering wheel and keep an eye on things through the bubble panel, binoculars, or periscope. At the bottom of the avalanche slide, discover the clubhouse, tic-tac-toe board, picnic table, two belt swings and trapeze. 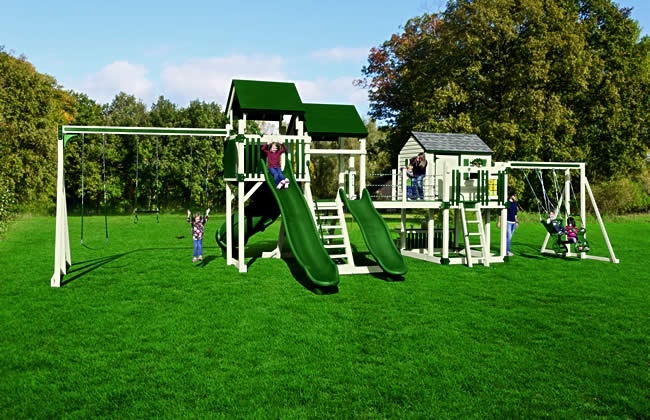 With so many possibilities for fun, this playset will actively encourage kids to discover all the joys of the great outdoors. The SK-3 Mountain Climber playset proves that going up is only half the fun. The other half is going down the ten foot avalanche slide. It will zip your little mountaineer back to base camp again and again. 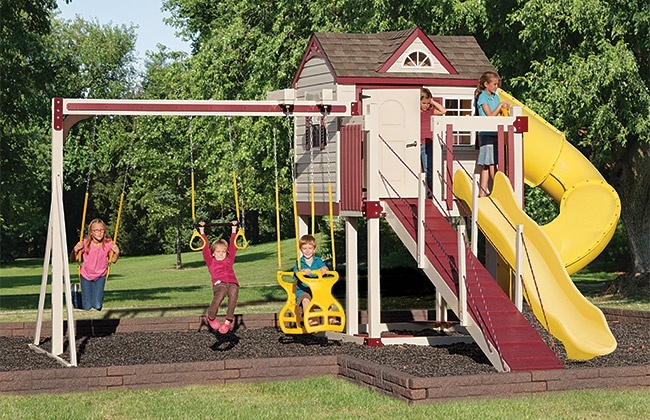 This playset comes standard with a belt swing, trapeze, baby swing, and three-rope tire swing. A steering wheel, telescope round out the fun. 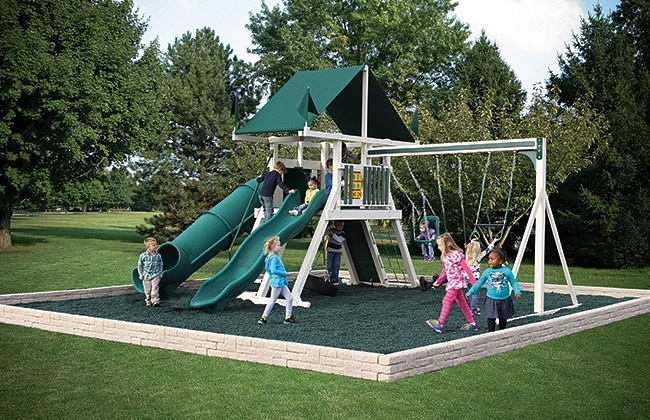 The SK-4 Mountain Climber swing set features a 25 square foot deck reachable by a flat step ladder, a five foot rock climbing wall or cargo net. From the deck your children can spy on their friends through the telescope or take a trip down the ten foot avalanche slide. 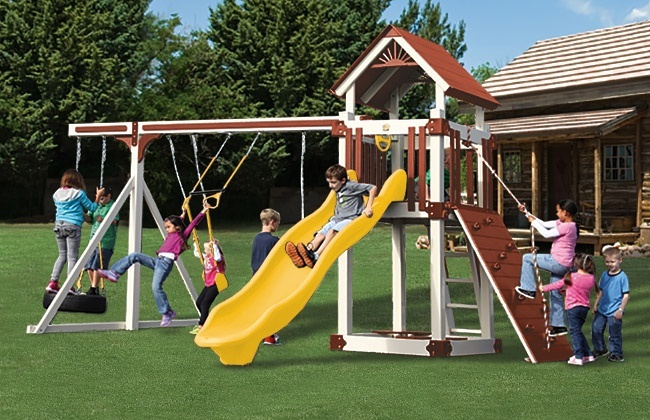 This playset’s three position swing bar has something for all ages including a belt swing, trapeze, three-rope tire swing and rubber infant swing. The fort on this Mountain Climber playset includes a 25 square foot deck, an excellent place to spy through the telescope or to hunker down for a backyard adventure. A rock wall climber, cargo net, ten foot wave slide, trapeze, three-rope tire swing, and belt swing round out this playground. Two slides are twice the fun. 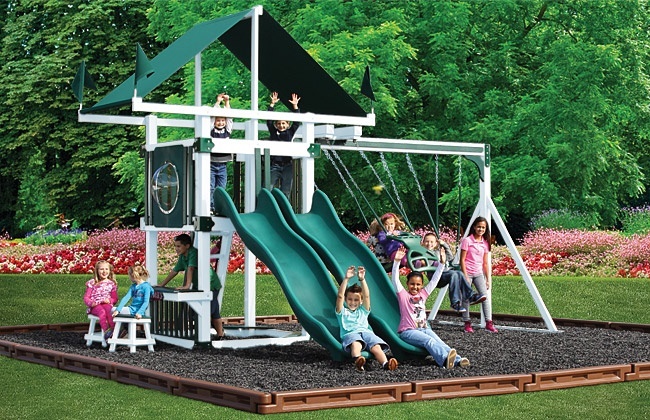 The SK-12 Mountain Climber playset features both an avalanche and sidewinder slide. Also included are a five foot rock wall, cargo net, belt swing, trapeze, baby swing, three-rope tire swing, telescope, and tic-tac-toe panel. 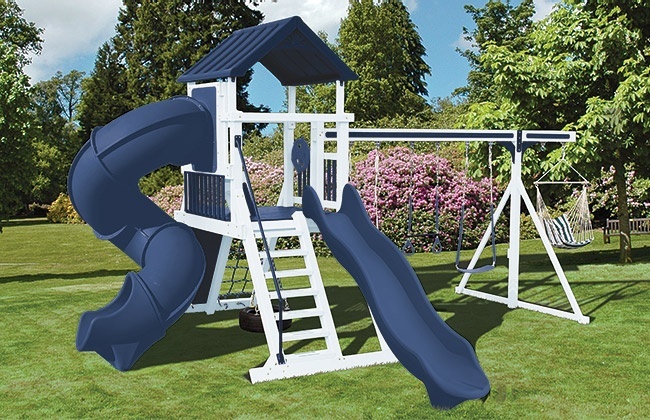 Whether your child is a thrill seeker or is simply seeking a space to unwind, this playset will suit their disposition. The turbo twister and the ten foot avalanche slide inspire hours of active play, while the hammock swing offers an ideal escape for lazy summer afternoons. 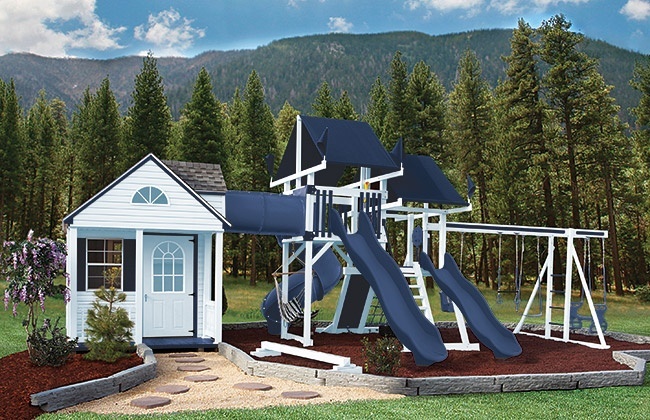 This playset is also nicely equipped with a five foot rock wall, cargo net, trapeze, belt swing, rubber infant swing, and three-rope tire swing. 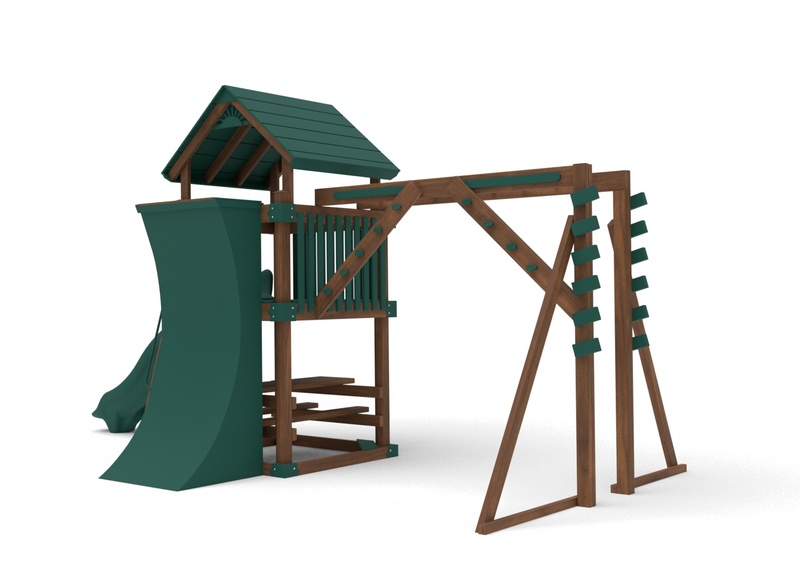 The Rocky Mountain Climber playset builds upon a solid foundation of fun. 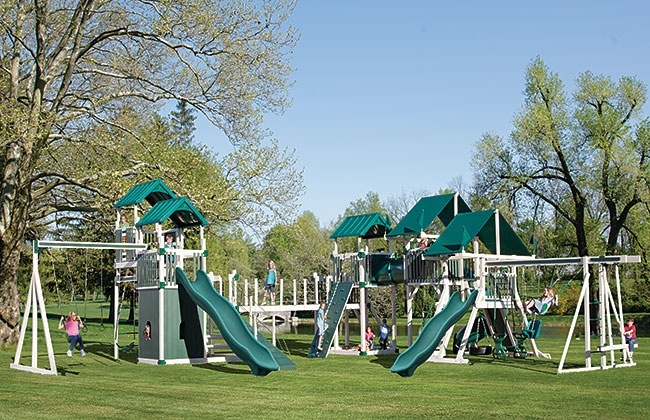 This playground offers the standard slide and deck combo, then multiplies that by three and adds a bubble panel, binoculars, ship’s wheel, three-rope tire swing, belt swings and, trapeze. This playset is the embodiment of a healthy and active lifestyle. 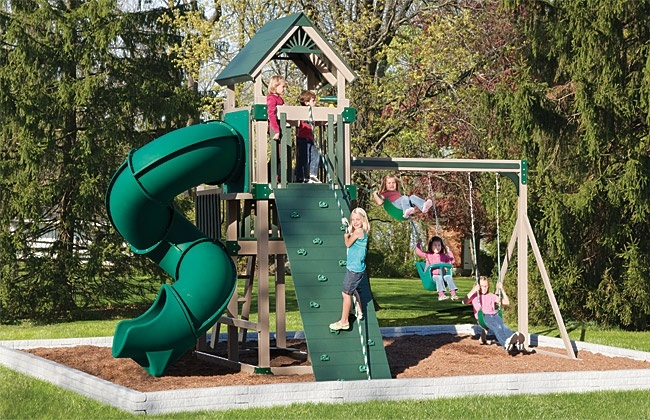 The SK-45 Retreat Climber playset is an excellent backyard getaway. The five by six foot playhouse is outfitted with two windows, vinyl siding and a shingled roof. Your kids will have hours of fun climbing the five foot rock wall and navigating the connector bridge. A four position single high swing beam and two position climber will provide plenty of swinging options. 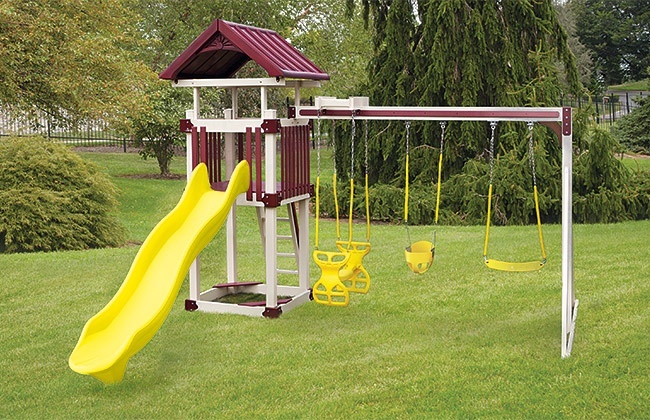 This swing set features two avalanche slides and a turbo twister slide. Accessories include a telescope, binoculars, tic-tac-toe panel and lemonade stand. The Cottage Escape playhouse is truly an escape in your own backyard. The cottage, complete with front porch, is perfect for pretend play. 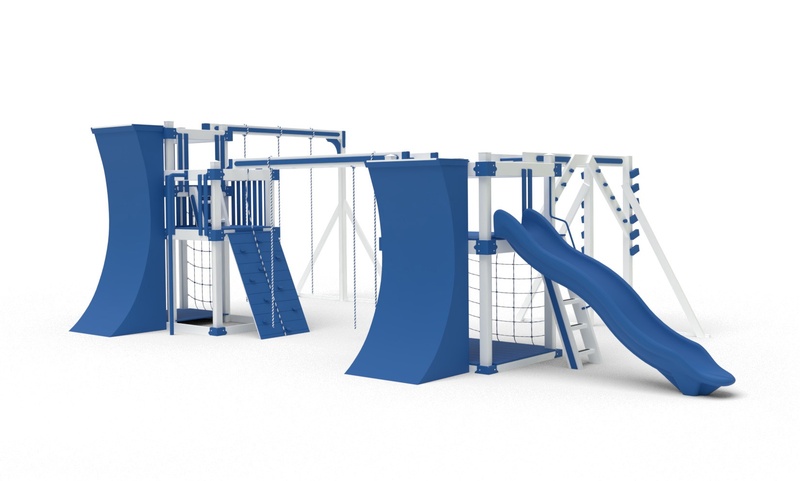 A tower tunnel, two tiered tower, ship’s wheel and periscope promote imagination, while the three slides, rock wall, cargo net, monkey bars, and balance will keep your little ones active. 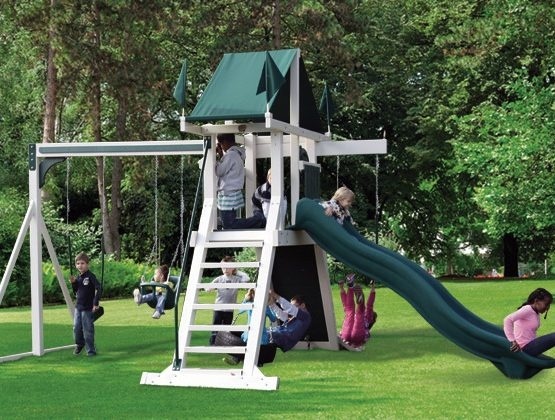 No need to fight, because this playset has a swing for everyone. There is a baby swing, belt swing, trapeze, three rope tire swing, plastic glider, and a hammock swing. With this many amenities, the Cottage Escape will inspire years of fun and enjoyment. 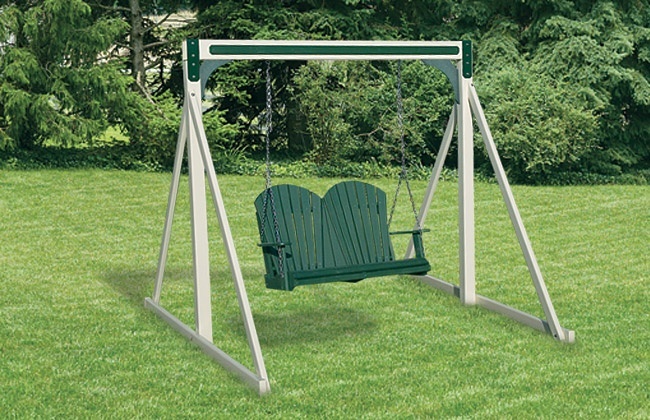 Our classic Fan Back Lawn Swing is an ideal retreat. Sit next to a loved one, and admire the tranquility of your garden, or kick-up your legs and get lost in a great summer novel. The fan back lawn swing is the perfect place from which to enjoy all that summer has to offer.